4:00 pm: Talk to Kevin. He made it to work ok. I'm actually quite miffed that he has to go to work tonight. I understand that a lot of employers are playing it by ear, but is it really worth it?? If it's a big enough storm to shut down schools than certainly we can shut down a restaurant or 2. Just sayin. 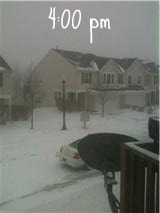 6:30 pm: It's really starting to come down now. It's Jacks bathtime and as we sit in the bathroom I can hear the wind and feel the walls shake. Did I mention that we are in the innermost room of the house? With no windows. And that we are the Middle townhouse unit. Yea, that's how windy it is. 7:15pm:Lights flicker. Luckily the power stays on. 7:30 pm: Jack goes to sleep immediately. I worry he will wake up from the howling wind but he doesn't even so much as flinch. 8:25 pm: Talk to Kevin who has left work and is headed to his parents house. Wish he could come home but it's safer for him to go there. I should take this opportunity to get some things done but I'm motivated to do nothing. So I head up to bed to watch TV. 9:00 pm: Realize that Real Housewives of Beverly Hills Reunion-part deux is on tonight and not Thursday!! Maybe this night won't be so bad after all. 10:07pm: Click over to the news... I wonder what they are talking about?? 10:08pm: Watching earlier coverage of people preparing for the storm makes me realize that I did not stock up enough junk food for this blizzard. Luckily, I found some Nerds leftover from Halloween. Desperate times right? 11:23pm: Head downstairs to crank up the heat again and realize the inner garage door was blown wide open. 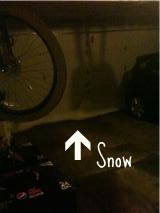 There is also snow blown inside the garage. Nice! Guess that explains why it feels like 30 below in here. 11:27pm: Tried to sleep but can't. Sounds corny but I have a harder time sleeping when Kev's not home. (also may be the 4 boxes of Nerds I inhaled) I turn on the TV and realize I never watched Gossip Girl yesterday! Bonus! 12:30am: I turn off the TV and try for sleep again. Before I go to bed I look outside. Snow is halfway up garage door but there are areas of the streets that you can still see pavement. 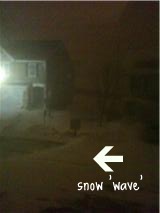 The wind is blowing the snow around and it almost looks like waves. Weird how it can seem oddly peaceful in the middle of such a powerful storm. 1:16am: In bed on my iPhone tweeting and well, writing this. As I write this I get a wonderful text from our friends who welcomed their daughter into the world at 11:56pm. Congrats Kris & Dena!! 1:41am: Still so cold inside. It would figure that this blizzard happens the one year we don't cover our windows with plastic. I creep into Jack's room to turn on the space heater. This kid is oblivious to everything and barely stirs. Even when I trip over his glider and knock down a laundry basket. I grab a few towels to cover the window cracks with. It helps, but not much. I'm really afraid to see the gas bill this month. I find and extra blanket and try again for sleep. 3:15am: Awaken by the sound of squealing tires. Sorry neighbor, you aren't going anywhere. Realize that the towels on the window work great but I probably should've turned down the heat. It's sweltering upstairs. Creep into Jacks room to shut off his heater. Trip over glider again. Salt. 8:00am: 2 cups of coffee make me slightly functional. Even though he slept all night it appears that Jack woke up on the wrong side of the bed. Awesome. 12:00pm: Killer Yo Gabba Gabba Dance party with my favorite dance partner. 1:00pm: After 20 minutes of bundling up, we step outside and "play" in the snow for 5 minutes. Jack seems unimpressed by the snow. Somewhere around 6 pm Kev finally made it home. Still bragging about breakfast. I think back on my plot to kill him, but I have to admit I kind of missed the guy. Plus, he makes great chili. And I'm hungry & too tired to hide the body. 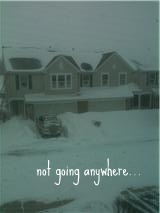 What did you do during Snowpocalypse 2011? ?